President Obama has suggested a “pause” following the failure of the most recent Israel-Palestine peace negotiations. During his peace talks pause, Obama should look back to 2006, the last time the U.S. and Israel “trusted” the Palestinians to speak for themselves. That was the year of the remarkable 2006 parliamentary elections in the Occupied Palestinian Territories. Elections for the Palestinian Legislative Council (PLC), the legislature of the Palestinian National Authority (PNA) were held on 25 January 2006. The result was a victory for Hamas, who won with 74 seats of the 132 seats, whilst the ruling Fatah won just 45. In terms of votes received, Hamas took 44.45% of the vote, whilst Fatah received 41.43% and of the Electoral Districts, Hamas party candidates received 41.73% and Fatah party candidates received 36.96%. 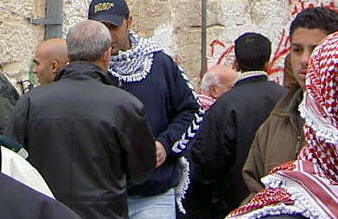 I covered that January, 2006, Palestinian parliamentary election from a Bethlehem polling place. President Jimmy Carter was also there for the election. He was the head of the international election monitoring group. It was a moment of great potential in Palestinian history. Unfortunately, Israel and the U.S. were not interested in any political steps that enhanced Palestinian history. Rather than bow to the will of the voters throughout all of Palestine—the election was held in Gaza and in the West Bank—Israel and the U.S. did what empires do, they refused to accept the results. The election of a new Palestinian government caught the Bush White House “by surprise”, or so the White House claimed at the time. It has always been difficult to believe that the vaunted spy agencies of Israel and the U.S. did not know, from inside sources, that the final election results would go against them. “Surprise” appears to be the automatic empirical response when Palestinians deviate from the prepaid script. Eight years after the 2006 “surprise” election outcome, the Obama White House was “surprised” by the latest Palestinian 2014 surprise. The 2006 election that gave Hamas legislative control of both Gaza and the West Bank, drove Israel and the U.S. over the brink. Israel immediately imprisoned a large number of newly-elected Hamas legislators. After losing at the polls, the U.S. sent military trainers to prepare Fatah militias to attack Hamas. Those attacks led to a military defeat of Fatah, adding insult to political injury. Eight years later, either surprised or just disappointed in the 2014 Hamas-Fatah unity government proposal, President Obama wisely chose not to follow the 2006 Bush script. Instead, still clinging to a peaceful solution, Obama called for a pause in the peace negotiations. Five months after that earlier January 25, 2006, internationally monitored election, I wrote a column in The Christian Century magazine, on June 13, 2006, entitled “Unilateral Proposal”. The column cited articles by, among others, President Jimmy Carter. Innocent Palestinian people are being treated like animals, with the presumption that they are guilty of some crime. Because they voted for candidates who are members of Hamas, the United States government has become the driving force behind an apparently effective scheme of depriving the general [Palestinian] public of income, access to the outside world and the necessities of life. How well did the new Palestinian government, under the duly-elected Hamas party, conduct itself in 2006? “both Israel and the U.S. continue to describe Hamas as a terrorist organization and refuse to talk with Hamas until it accepts Israel’s “right to exist”—a diplomatic demand that Virginia Tilley, professor of political science and international relations at Hobart and William Smith Colleges, finds less than compelling. In the online newsletter Counterpunch (May 12, 2006), Tilley identifies a logical flaw in the “right to exist” demand that has led to the international isolation of Hamas. “Diplomatic recognition of a state routinely requires one bit of vital information: ‘right to exist’ where? Israel’s borders are not set. Rumbles of criticism of the Israel/U.S. response to Hamas’ political victory, were beginning to emerge in the U.S. in 2006, most notably, as my Century column indicates, from two academics, Stephen Walt of Harvard, and John Mearsheimer of the University of Chicago. Robert Fisk had interviewed Stephen Walt for the Independent, on April 27, 2006. I wrote at the time that the interview focused, “on a report on the Israel lobby that Walt coauthored with John Mearsheimer”. Originally published as an essay in the London Review of Books, in March, 2006, that report was later expanded into the Walt-Mearsheimer book, The Israel Lobby and U.S. Foreign Policy. How will the Lobby respond when Barack Obama yields the White House to the next president? The best way to answer that question is to consider the two front-runners now contending for the presidency. Hillary Rodham Clinton appears almost certain to win the Democratic nomination, and for the moment, former Florida Governor Jeb Bush is the leading mainline Republican candidate. Either of these candidates would find favor with the Israel Lobby, especially Clinton. President Obama has until January, 2017, to break the Israel Lobby’s presidential winning streak. His current peace pause is the opportunity for him to make a sudden, unexpected and dramatic shift in his handling of the Middle East. Looking back at President Bush’s deliberate scuttling of the unified Palestinian government that emerged in January, 2006, President Obama could pivot from automatic subservience to the Lobby and seize this moment in history to support a unified Palestinian government. Asharq Al-Awsat is a pan-Arab daily newspaper, printed simultaneously each day on four continents in 14 cities. It recently published an analysis of the new Hamas-Fatah agreement (called the Gaza Agreement) by Barakat El-Farra, Palestine’s ambassador to Egypt and permanent representative to the Arab League. The new Gaza Agreement stipulates operational mechanisms to implement the Cairo Agreement and the Doha Declaration. Such mechanisms include the formation of a government of national consensus, headed by President Mahmoud Abbas, within a five-week timeframe. Specialists and technocrats are to prepare for legislative, presidential and National Council elections. President Abbas set the date of simultaneous elections for all three bodies for at least six months in the future, after the formation of the government in consultation with the Palestinian factions. What would be the impact of of the implementation of the Gaza Agreement? It would enable the Palestinians to better confront the Zionist occupation, restore the Palestinian cause to its rightful status on the world stage, and strengthen Palestine’s position at the negotiating table. It would also ease the suffering endured by the Palestinian people as a result of their divisions, and renew their executive and legislative frameworks. By embracing this Agreement, and by bringing the EU and other world leaders with him in his support, President Obama would announce to the world that he was the man of peace he claimed to be when he ran for election in 2008. After winning that election, and to the surprise of many, President Obama was awarded the 2009 Nobel Peace Prize after less than eight months in office. A dramatic move this summer, a move in which he would display his support of a unified Palestinian government, would be the moment in which Barack Obama finally earns that 2009 Nobel Peace Prize. 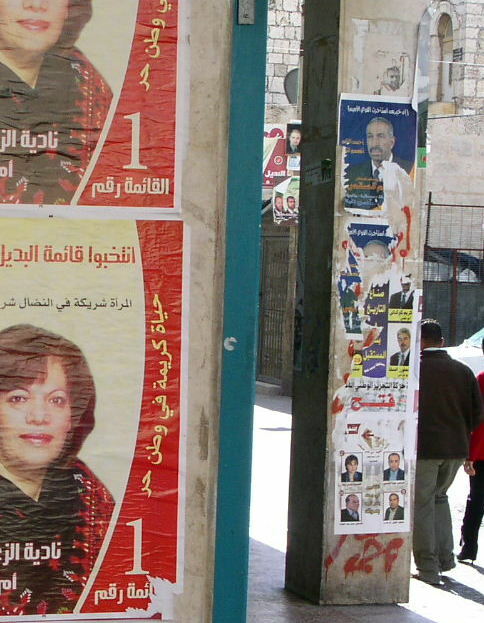 The 2006 picture at top shows a city street in Bethlehem with campaign posters widely displayed. The picture was taken by Connie Baker. The picture further down shows voters waiting to go into a Bethlehem polling place, also in 2006. This second picture was taken by the author. This entry was posted in Hillary Clinton, Jeb Bush, Middle East Politics, Netanyahu, Obama, Politics and Elections. Bookmark the permalink. Restated, this will be the ultimate test of Obama’s legacy: either truly the “man of peace” or the willing neo-con. Given his record, its difficult to imagine the former. Moreover, the “peace” that Kerry is thinking of — no solution for the refugees and no truly viable state — is one that at best will again divide the Palestinians, or be rejected by them, and pushed by the Lobby so as to regain its status going into 2016. Then what? P.S. Hillary or Jeb, really? To borrow a book title from Robert Fisk, “Pity the Nation” and the rest of us. It’s Israel that denies Palestine the right to exist. Many members of Israel’s Parliament and political parties deny the right of Palestinians to their state. Why have the Palestinians agreed to talk with the Israeli government? The answer is they wanted a two state solution, Israel does not. Israel looks for any excuse to make sure that a deal does not happen. They just keep stealing land and building more apartheid settlements as the world is silent. We have believed the big lie theory for too long. If you repeat a lie often enough, it becomes fact in the minds of people. Israel has the mainstream media in its corner shilling for them and preaching their lies and distortions. The truth is, Israel has sabotaged peace talks for decades, and tried to deceive the world by blaming Palestinians. Actually they succeeded in deceiving everyone, and they have every thing they want–all of Palestine, and an apartheid West Bank and East Jerusalem, where Jews live under one law, and non Jews another. They have been brilliantly (though diabolically) successful in getting just what they want. They have the US congress in their pocket. Great essay, Jim. I suspect Obama’s pause in the peace talks is, as you write, a “pregnant” pause. There’s intense, international debate underway about the Holy Land issues, and something significant is bound to follow. I, personally, believe that Obama will do his best to resolve the Palestinian-Israeli conflict before he leaves office. Which is why he has my support. Besides, who else is there to support? If so, is it even possible Obama could defy the powers behind the throne? The US and Russia, amongst other nations, have voted against Israel’s annexation of Arab East Jerusalem, building settlements in the West Bank, and planting illegal terrorist-settlers. Yet a significant number of the illegal settlers are Americans and Russians. The American settlers have dual citizenship. Perhaps, the Russians, too. This is beyond preposterous! Besides Israel, the Palestinian leadership should take on the US and Russian Federation for permitting their citizens to become illegal terrorist settlers on occupied Palestinian lands. It is against the Geneva Convention. The World Criminal Court should demand that the US and Russia withdraw their citizens and bring them to justice.